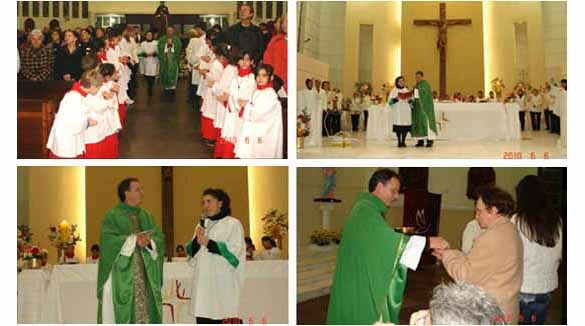 It is June 6, 2010, and the Parish of St. Antonio in Curitiba, Brazil, is preparing for the feast day of its Patron Saint on June 13. Fr. 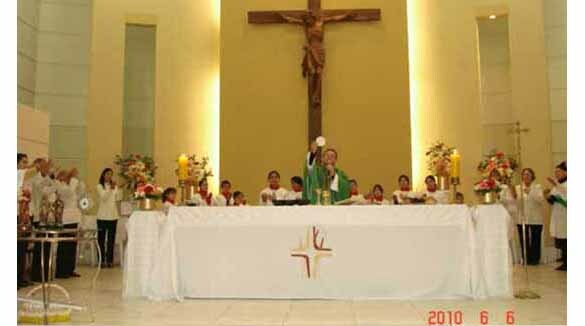 Emilson Oliveira, O.P., is saying the 7 p.m. Mass, the last Sunday Mass, assisted by a woman who is taking an active part in the liturgy. Fr. 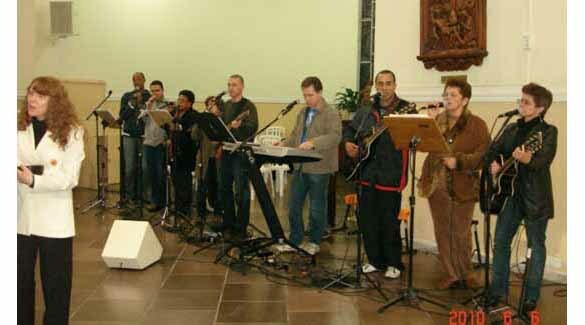 Oliveira makes the first Elevation of the Host by himself, below first row. But shortly after he breaks the Host and says the prescribed prayers, he invites his assistant to make the minor Elevation that precedes Communion along with him. This is what you are seeing in the photo above. It certainly goes one step further in accustoming the faithful to the woman-priest.This tendency has been promoted everywhere in the Conciliar Church under different pretexts. Below second row left, in the entrance procession, Fr. Oliveira comes up the aisle side-by-side with his female assistant; at right, he encourages her to read the Epistle, and then, third row left, to address a small speech to the congregation. 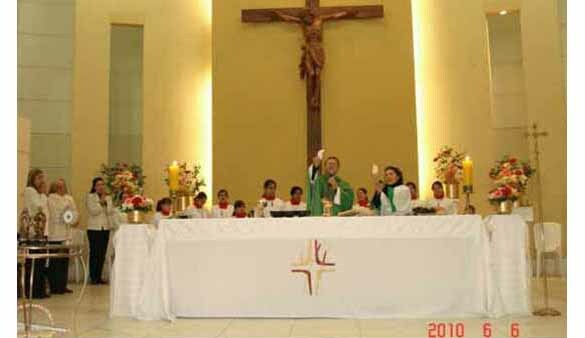 At right, the two (one of the faithful blocks her from view) distribute Communion. To be fully in tune with the Vatican's latest eulogies of modern music (here, here & here), the Mass is also animated by electric guitars, last row.